This project consists of a 4 storey, 68-unit apartment building and 5 contemporary townhouses. The building’s design responds to its site and surroundings, with the building’s prominent entry marking the street corner. The massing of the apartment building forms an ‘L’, with the townhouses nestled within, to take advantage of the south sun. The drive behind the project was to provide much needed affordable rental housing for working couples and families. This was achieved by providing upscale townhouses for sale, which would then fund the construction & management of the rental building. The 4900 m2 building has a mix of studio, one bedroom, and two bedroom units. The townhouses are each 185m2 (2000 SF), with separate driveway access, a private parking garage, and two visitor stalls situated at the end of the driveway. The buildings sit above one level of underground parking with 73 parking stalls & bicycle storage. 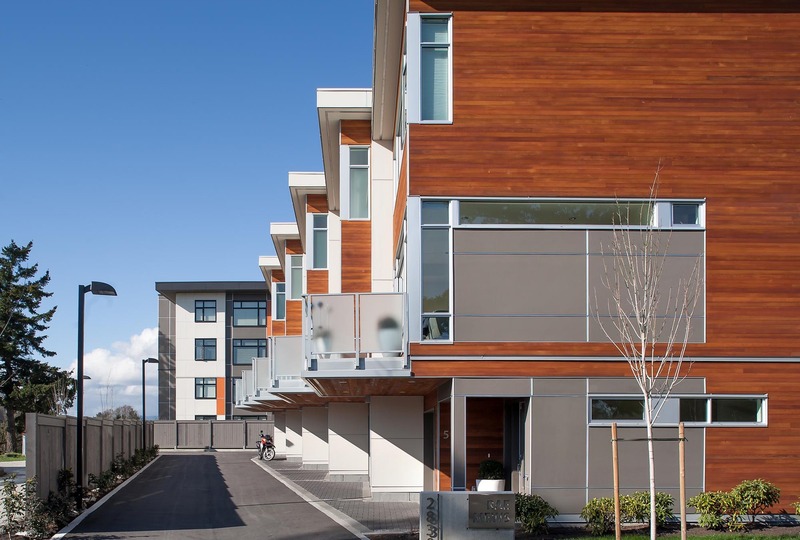 Winner of the 2014 VREB Commercial Building Awards - Excellence Award for Multi-Family, New Construction.